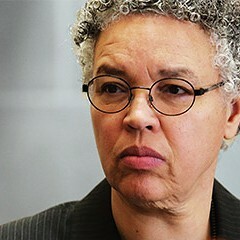 Is Toni Preckwinkle building a political machine? Toni Preckwinkle has pushed a flurry of no-nonsense reforms since being elected Cook County Board president in 2010. But her attempts to extend her influence this election season have left a longtime ally wondering if Preckwinkle's brand of independence is drifting toward “machine-like” power politics. "You don’t want to become everything you’ve done a great job of not being your entire political career," says state senator Kwame Raoul. 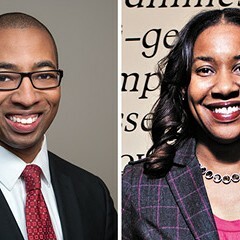 Raoul has been a loyal member of Preckwinkle’s political organization since she helped him step into Barack Obama’s old state senate seat in 2005. Raoul backed Preckwinkle’s bid for the county board presidency, and they both see themselves as part of the long tradition of independent Hyde Park progressives. “I think she’s refreshing and she’s doing a great job,” Raoul says. And if those good people help spread the word about Preckwinkle’s benevolence and might, even better. Long before she had the tentacles to support good candidates for Congress or the Illinois Supreme Court, Preckwinkle was casting herself as a new kind of political independent: reform-minded but also pragmatic and tough. She’s never aspired to fight the good fight only to come away with nothing but a moral victory—that’s just another way of saying you’re a weakling and a loser. Preckwinkle’s Fourth Ward political organization has never been the type that kneecaps its enemies—at least not literally. But when she’s behind somebody, she’s definitely not behind anybody else. In 2008 she informed a property owner in the ward that it wasn’t the best idea to rent space to the campaign of businessman Kenny Johnson, who was battling Will Burns for the 26th District house seat. Naturally, Burns went on to win. Last year he moved into Preckwinkle’s old City Council slot. Johnson was still interested in being a state rep, so he approached Preckwinkle and her political team about backing him to replace Burns. They weren’t interested. In fact, Preckwinkle won’t even mention Johnson by name. “I think I’ll just stick to talking about Christian,” she says. That would be Christian Mitchell, a former Burns aide and Preckwinkle’s pick in Tuesday's election for the house seat. He's also got the backing of Mayor Rahm Emanuel and Governor Pat Quinn. By all counts, Mitchell is bright, energetic, and sufficiently progressive for the Hyde Park types. “I see myself as trying to be part of that legacy,” Mitchell tells me. He’s also 25 years old, which is why Raoul decided not to endorse him about six months ago. But eventually he concluded that it was dishonest to keep his thoughts to himself. Earlier this week Raoul publicly endorsed Johnson, who's 41. It didn’t go over well with Preckwinkle’s team. An official with Mitchell’s campaign described it to me as a “betrayal.” One of Preckwinkle’s top political advisers said he was planning to have a "conversation" with Raoul after the election. Ironically, aside from who’s backing whom, it’s hard to distinguish the policy views of Mitchell and Johnson. More Disparity Week on the Bleader. Preckwinkle and other potential challengers lag far behind Emanuel in raising money.